plz send drug inspector exam notification and how to apply..? Re: Drug inspector exam notification? How to apply for it? 2.minimum eighteen months’ experience in manufacture. a) The written examination will consist of two papers. The examination in Pharmacy(core subject) consists of 200 marks. b)General Knowledge will be in Paper-II consisting of 50 marks. c) Then there will be the Viva-Voce Test for 25 marks. In order to apply for the drug exam candidate need to have a minimum eighteen months’ experience in manufacture , then only candidate is eligible for this exam. Candidate must have age in between 21 to 35 years. There is also Viva-Voce Test for 25 marks and then there will be physical fitness test . Drug inspector exam is conducted by UPSC every year .The drug inspector examination is also conducted by different states. The age of the candidates should not be less then 21 years and above 32 years.Relaxation given to reserved caste students in upper age limit . 2.Interview ::Its a Viva Voce Test for 25 marks. The notification for the Drug inspector exam will be notified through the employment news paper or through the official website of the UPSC. You can apply for the examination through online as well as offline .Till now there is no notification is available related to the drug inspector exam. may i know the examination date? in which month exam will be conducted& can i have examination date? will you pls tell us the syllabus for Drug Inspector Paper-I & paper-II. AP Drug Control Administration Service Released Notification for post of Drug Inspector. The examination for DRUG INSPECTOR is conducted by state public service commission. pharmacology or microbiology can apply for drug inspector exam. >> The age of the candidates should be between 21-32 years. the examination is conducted by state public service commission and you have not mentioned the state which you belongs to. iam studying b.pharmacy final year last semester.Is iam eligible to apply for drug inspector post released by appsc ? You must be completed graduation from recognized university in Pharmacy of Pharmaceutical science or, Microbiology from Recognized University or, Medicine with specialization in clinical pharmacology. You can apply online or, offline. Hai sir, i compleeted b.pharm final year. but 3.2M.C. backlog is there. i have done b.pharmacy........and working in retail and have experience oof 1 year.............. am i eligible for the drug inspector exam...??? Microbiology from any recognized university. You should have at least 45% of marks in your degree. and this exam is conducted by UPSC. UNIT – II – MANUFACTURING OPHARMACY. UNIT – III- PHARMACEUTICAL ANALYSIS. UNIT – IV – MEDICINAL CHEMISTRY -. UNIT – VI – PHARMACOLOGY & TOXIOLOG. To become a Drug inspector you need to apply for SSC exam. SSC stands for Staff for Selection Commission. SSC exam is conducted once every year. To apply for this exam you need to be a Graduate from reconized university. If you are in final year of your graduation then also you are allowed to apply . You need to be between 20 to 27 for assistant and sub-inspector post`s. You need to be between 18-17 years for Inspector post . You can apply online for this exam. for this post you have to apply for SSC-staff selection commity. ------if you are studying the final yr,you also eligible. Drug inspector is one of the reputated post in India.In India there is a huge scoe for DI. 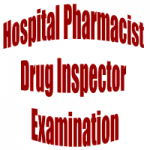 Drug inspector exam is conducted every year by UPSC for those candidates who desire to make a career as a drug inspector. In order to crack drug inspector exam you need to work very hard as you must have deep knowledge about all pharmacy subjects. - The basic qualification for the Drug Inspector exam is a graduation in pharmacy or pharmaceutical science. - You should also specialize in the area of clinical pharmacology and microbiology. It is required that you should complete your graduation from PCI recognized institute. - You should not be above 32 years of age for attending this exam. The exam will involve 2 major papers from the areas of pharmacy and also general knowledge. Those who qualify in the written test will be called for the personal interview. Regarding the dates of the drug inspector exam, it will be available from the official website of UPSC. A candidate must have hold a degree in Pharmacy of Pharmaceutical Sciences or Medicine with specialisation in Clinical Pharmacology or Microbiology from a University established in India by law. No person who has any financial interest in the import/manufacture of sale or drugs and cosmetics shall be appointed as an Inspector, under the Drugs & Cosmetics Act, 1945. A candidate must be under 32 years and above 21 years of age. When is the Drug Inspector Exam?